Travel Journal: White Express in Indonesia | Sankosha Co., Ltd. 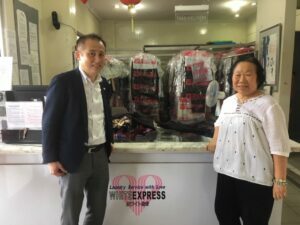 I visited White Express in Tangerang Indonesia on 20th, March /2019 to see the factory and to meet Ms. Surjawati Tanzil. Ms. Surjawati Tanzil (陳 香蘭),　general manager of the factory, visits Sankosha booth of EXPO Clean and Laundry exhibition held in Jakarta every year. She purchased DF-050-V4 and LP-500A after the business meeting during the exhibition. She has very unique background. She has experience to grow cotton and to make textile and to sew garment, and today she is working for washing garments. She said she had handled from material to product then washing and care today. Thank you very much, Ms. Surjawati Tanzil. © Sankosha Manufacturing Co.,Ltd. All rights Reserved.